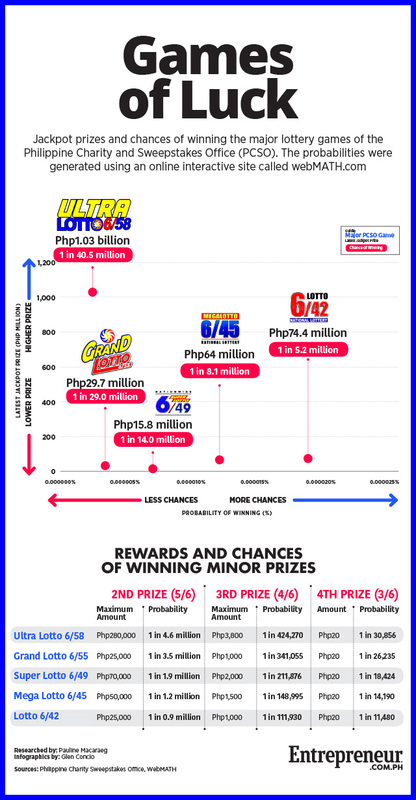 What are the Chances of Winning the Ultra Lotto 6/58 Compared to Other PCSO Games? Despite tiny odds, people are drawn to Ultra Lotto because of the more than Php1 billion prize. Other games may offer better chances but smaller prizes. The odds of a lotto ticket winning the Philippine Charity and Sweepstakes Office’s (PCSO) Ultra Lotto 6/58 draw tonight, which commands a top prize of more than Php1 billion, is only one in 40.5 million. Despite the miniscule chances of winning, huge numbers of people continue to buy Ultra Lotto 6/58 tickets, drawn by the record-high top prize that already hit more than Php1 billion. In the week to October 10, the last draw, the accumulated top prize rose by Php176.7 million, a sign of the massive sales of lotto tickets for the game during the period. That’s almost six times compared to the average weekly increase of only Php31.7 million in September. Yet, if lotto bettors didn’t pay too much attention to the more than Php1 billion top prize, they’d actually have a higher chance of winning if they bought tickets for the other major or six-digit PCSO games. For example, the odds of winning the Lotto 6/42 game is one in 5.2 million, almost eight times better than the Ultra Lotto 6/58. Of course, the Lotto 6/42 top prize is only Php74.4 million as of the last draw, just a fraction of the Ultra Lotto 6/58’s top prize of more than Php1 billion.